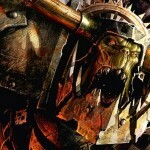 Well, the Ork codex has been out for over a week now, and I’ve played a couple games, so I can give my thoughts on it. I’m not going to go with a typical review structure, this is an opinion piece and as such I’ll be sharing my opinions, rather than breaking down the entire book piece by piece. I have to first comment on the layout of the book. A lot of people have complained about it, but I think it works well. One of the major annoyances in the past was flipping from one section of a book to another to reference a unit’s special rules as you were looking at its entry. The new layout means you get the unit’s rules, army list entry, description, and a photo to help newer players recognize the model(s) to use, all on one page. It also helps them keep a similar format when adding rules in White Dwarf or future supplements, allowing for a cohesive look. I have to take a moment and mention Waaagh! Ghazghkull next. This supplement, which I’ll just shorten to W!G, came out a week after the Ork codex, unless you happened to buy the Warboss edition (as I did). The book not only contains a new detachment, new Warlord traits, and new relics, it also has a number of formations for use with the Orks. Said formations are a good way to get around limitations with the force organization chart, or just get some bonuses if you were going to load up on multiple units of a specific type anyway. 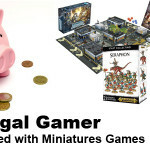 While the extra price is hard to swallow, it really does open up a lot of options for Ork players, and some of the relics are almost “must-have” (such as a 4+ Kustom Force Field, a banner pole that makes the bearer and his unit Fearless, and a “Supa-Cybork” body that gives Feel No Pain, Relentless, and Eternal Warrior). Orks aren’t a “weak” army as people are noting, but they aren’t the kind of powerhouse that Eldar, Tau, or Chaos Daemons can be. There’s no immediately noticeable “Death Star” build. I feel like that’s a good thing. One of the biggest changes was the mob rule, which can lead to a unit running away or suffering extra hits. I get the concern over the potential for mobs to run away, but that’s something most armies deal with. I haven’t yet had a unit fail a Ld test while still being large enough to actually take into account any of the results on the chart. Shifting units around in force organization was, I believe, done with one purpose in mind: Push Unbound army formation. Ditto for the numerous useful buffing HQ choices while not having enough slots to really take them. If you want a Waaagh!, you need a Warboss. Want a KFF, you need a Big Mek. Want FNP for a unit, you need a Painboy. If you try to add extra protection to just one unit, it’ll chew up your HQ slots, and that’s before considering a Weirdboy. When looking at recent releases like Astra Militarum, where you can have six characters that buff units and aren’t taking up any HQ slots, it feels even more like a slap in the face. The removal of rules shifting units to Troops with certain character types is almost certainly a move to push Unbound, given that White Dwarf recommended Unbound if you wanted to make the kind of army that would have Bikers instead of Boyz, or more than three Deff Dreads and/or Killer Kan mobs. The shift of Ghazghkull to a Lord of War choice was similarly to help push the acceptance of Lords of War (as is, I imagine, the inclusion of the Stompa in the codex). If people just ban Lords of War outright, Ghazghkull can’t be used. He’s not even a terribly impressive character, given that he has no invulnerable save and just a 6+ Feel No Pain. Ghazghkull is likely at his best leading his personal retinue formation from W!G, which can be a potent unit to throw at people. The new Ork codex seems to be going the direction of much of 40K recently, and that’s two armies running around the table shooting each other and not getting stuck in. Even buying large mobs, you only have so much you can do to protect them, and they have to wade across the table taking shots along the way. Even if you load them in open Battlewagons and somehow manage to get across and leap out at a full size of 20, you have to face Overwatch fire and then your opponent almost always hitting first. Basic Boyz mobs have nothing to deal with armor in combat, save for a power klaw on a Nob, who also can’t buy ‘eavy armor unless the entire mob does. This means that Space Marines will shrug off pretty much all hits, and the idea of using the Boyz as ablative wounds for your one guy who can actually do some damage is nullified by a smart opponent issuing a challenge, which lets him direct attacks specifically at the Nob to try to kill it before it swings, something that’s not terribly difficult with a 6+ save. You could try attaching a Mek with a killsaw to a unit, but then you’re paying 45 points for three attacks that will only be S6 if you didn’t charge. Aside from power klaws and killsaws (and disregarding vehicles), the only other “power weapons” in an Ork army are burnas, which are limited to Burna Boyz and Kommandos. Burna Boyz have gone up in price while remaining horribly easy to gun down. Kommandos have Infiltrate and Stealth, so they can get close to the enemy sooner, but can’t charge on the first turn, and a keen enemy will direct a good bit of fire at them. Contrast these scenarios with the firepower that Orks can bring at AP3 or higher: Numerous rokkits that are amazingly cheap; kustom mega-blastas/slugga/kannon on Meks, Big Meks, Kans, Mek Guns, and the Morkanaut; Zzap Gun; Smasha Gun; Kannon; Killkannon; Boom Bomb; Shokk attack gun. You can load up nearly every slot with something that has access to AP3 or better. If you take Shoota Boyz, you’re going to have a good number of shots with nice Strength, too, which doesn’t diminish in subsequent rounds like Slugga Boyz’ Strength will if combat goes past one turn. And that’s all to say nothing of the Weirdboyz’ impressive array of AP3+ witchfires. The Ork army will need synergy to work, and that’s going to be tricky for some people as they try to work it out. If you want to get some units into combat, you’ll need to provide them with covering fire and give your opponent multiple threats to deal with. The HQs will give you extra protection, but you’re still limited with them overall, so you’ll have to spread the protection out. 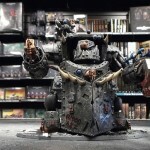 Orks can hold their own with these new rules, just with a touch of creativity needed. As noted above, there is no one “auto-win” build, so you can build multiple styles of army and have a reasonable chance of winning. Most importantly, the army if fun to play, and the codex incorporates some of the old humor and charm.